Majority of spring climbers are yet to reach Kathmandu. 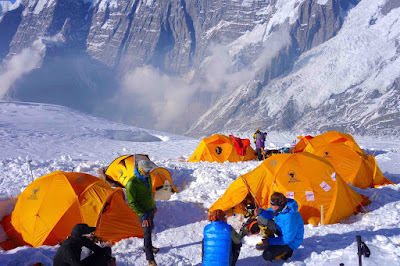 Though, on Annapurna, some teams are already thinking of a summit attempt this week. They await good weather window and a solution to dangerous portion of route below C3. Mar 27th and 28th were predicted to be bad weather days and it snowed in the region, as all climbers remained at BC. 77 year old Spaniard, Carlos Soria, thinks that they will be able to launch a summit push in next couple of days and will reach the summit at around April 4th. 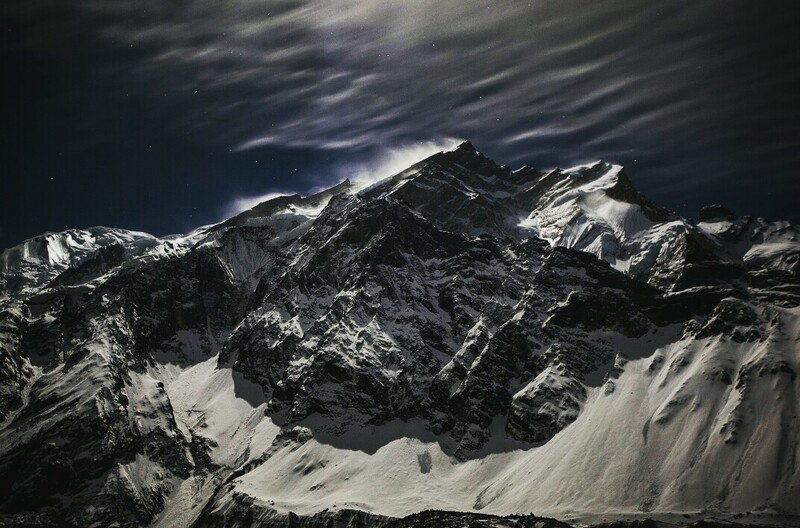 “The snow has given way to the wind at the Base Camp of Annapurna,” the team wrote in a dispatch this afternoon. A Sherpa team – combined from different expeditions – have been fixing ropes on the mountain ahead of foreign climbers. The route has been established till lower C3, as of now. “Lower C3 sits under a looming Serac. There is an option to put a high C3 but finding a spot is tricky” – explains Chris Burke. However, there is another complication. 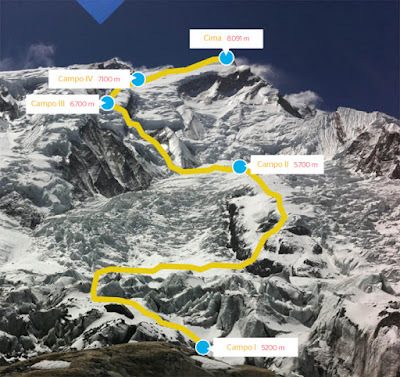 “The route up to Camp 3, at some point, for some dozen minutes overcomes a rock gully having atop one of the biggest hanging Seracs I have ever seen. One serious ice avalanche started from there yesterday evening, while we were digging out our tent platform (at C2), and intersected the climbing route. Totally unpredictable. There is no other safe or safer alternative to reach the upper part of Annapurna. ” wrote Alex Gavan. The Romanian climber is now considering the options for future course of action. Alex and Tunc Findik pre acclimatized in Khumbu valley. The two climbers established C2 on 24th. Apart from Spanish team and a Korean expedition, there are more than a dozen other climbers on Annapurna this season. These climbers, including some very strong individuals, share climbing permit and logistic facilities. 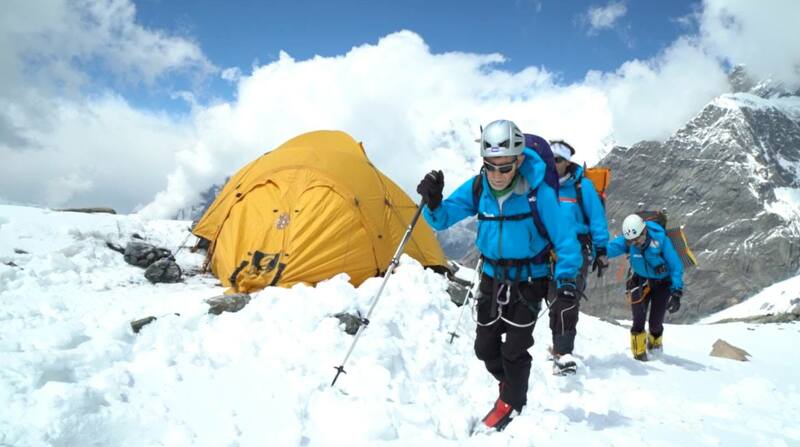 Chinese lady climber Luo Jing was also on Annapurna, last year. 23 year old Jost Kobusch from Germany is youngest one on the mountain. The two along with Swiss Guntis Brands, Bulgarians Atanas Skatov and Boyan Petrov and Israeli Nadav Yehuda have already set up C2. Some climbers – Italian Mario Vielmo, Hungarian Dávid Klein and a couple of Russians – have just arrived at BC. All in all, there are around two dozen foreign climbers on Annapurna this season.